The type of daily, radical hospitality that Rosaria Butterfield writes about is completely out of my comfort zone. Sensing conviction, my conscience was soon relieved as I rationalized two dates scheduled on my calendar to open my home—one to host an overnight retreat for the young women in my home church and another to host church planting wives in my area. This, however, is not exactly what Rosaria Butterfield is referring to. This manner of hospitality doesn’t worry about matching dishes, dirty windows or weeds in the garden. It’s the kind that is OK with not knowing how many will show up for a meal. It’s the kind that doesn’t care if someone else’s hairy dog sleeps on the couch. It’s the kind that gets up at 4:30 a.m. every day to start cooking or the kind that sacrifices luxuries to accommodate a higher grocery bill—every week. The meal may be beans and rice, or soup and fresh bread, but the focus is on relationships with people who may be different and hold different worldviews. It focuses on safe conversations with open Bibles, which build trust between skeptical unbelievers and authentic Christians. Butterfield is a former tenured professor of English and women’s studies at Syracuse University. As a former atheist, LGBT advocate and feminist, she was dramatically converted by means of hospitality herself in 1999. Rosaria is married to Kent, a Reformed Presbyterian pastor in North Carolina, and is a homeschool mother, author and speaker. She is an advocate for adoption, foster care and SAFE Families for Children. Butterfield is one of the keynote speakers at the BGCO Women’s Retreat at Falls Creek in April. The book is a blend of autobiography and theology. Butterfield writes in the first person and invites readers into her life as she shares her devotional life, her home life with her pastor husband and adopted children, and unique unconditional love for her neighbors. She writes about her difficult childhood, complicated relationship with her mother and her time in the LGBQ community. She writes skillfully about incidences requiring church discipline. The story of the reclusive next door neighbor Hank who gets busted for the meth lab in his basement is compassionately woven throughout the book. 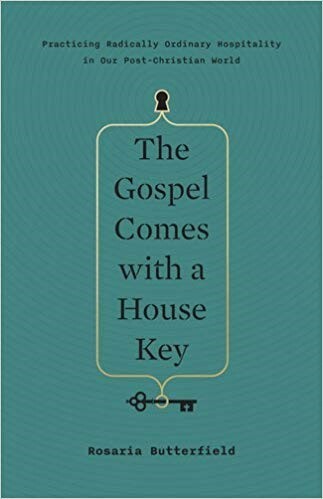 I highly recommend The Gospel Comes with a House Key for both men and women, married and single. Warning: it will step on your toes. Butterfield doesn’t pull any punches. She is unrelenting in her stance on sin and repentance. The book will challenge your evangelistic efforts and cause you to examine your relationships with different and difficult people in your neighborhood and life. Perhaps it is time to recognize the idols of comfort, control, safety and security that have subtly taken precedence over the Lord. Perhaps it is time to confess that we’ve made our homes private sanctuaries and stop using excuses of being incapable or too busy. In the end, I was entertained and inspired, but I was also convicted, challenged and called to action. Reality is, I really can’t do it. This is the fruit of a Spirit-filled life. My life won’t look just like Rosaria’s, but with God’s help I can do better—a lot better.